For years, one of the most essential sources for study of the Normandy invasion was known only to a select few and nearly unobtainable even to those who knew of its existence. It has never before been translated. None of the major English language histories of the Normandy Invasion refer to it, even though it is the history of the only German armoured division that was in place in the Caen area at the moment of the invasion. It reveals key facts that are missing elsewhere. At long last, Werner Kortenhaus’ history of the 21. Panzer Division has been published in English. Kortenhaus’ account of the division’s subsequent commitment, in the Lorraine - Saar Region - Alsace area provides intriguing detail on this little known sector as the southern wing of Patton’s 3rd Army strove for the Upper Rhine area of Germany. The last section follows the division after its hasty transfer to the Oder Front, facing the final Russian onslaught on Berlin. In revising and updating his account, originally released in two massive typed volumes, Die Schlacht um Caen, 1944, Caumont, Falaise Seine, der Einsatz der 21. Panzer Division in 1989 and Lothringen Elsaß, der Ostfront, der Einsatz der 21. Panzer Division in 1990, Werner Kortenhaus has exhaustively researched all available sources in German, French and English to supplement his own experiences and those of his fellows and the many individuals whom he interviewed. The result is a seamless account of the Normandy invasion in the British sector from the German viewpoint that sheds new light on many controversial issues. The account continues, following the division and surrounding events during the retreat to the Seine and the division’s later commitment in Alsace - Lorraine and, finally, on the Oder Front against the Soviet Union, and its eventual demise in the horrors of the Halbe pocket. The account is not restricted to the history of the 21. 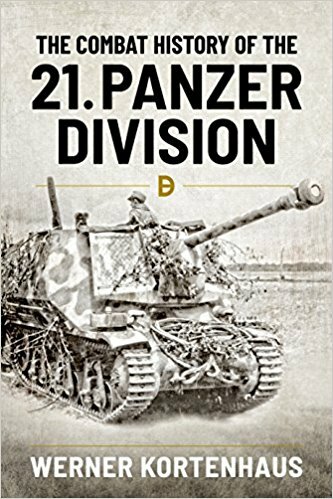 Panzer Division, but includes detailed analysis and exposition of actions of adjoining divisions and of the larger picture, from the German viewpoint. Helion’s English edition includes a large number of rare photographs and a separately-bound book of newly-commissioned colour maps. Werner Kortenhaus’ study represents a significant contribution to English language material available regarding a Heer Panzer division, besides its extensive coverage of German armoured operations in Normandy, Lorraine, Alsace and elsewhere.